SUMMARY: Health coaching and the tools and technologies supporting it are critical elements of a population health management approach. 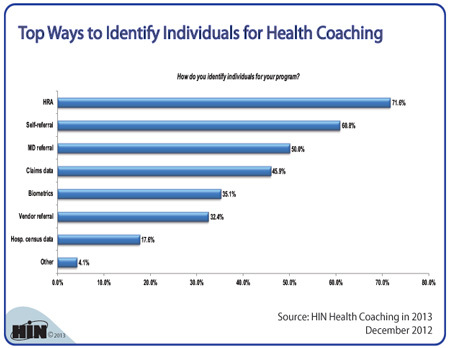 According to 2012 HIN survey data, nearly 72 percent of healthcare companies use HRAs to identify individuals for their health coaching program. We wanted to see which other ways healthcare companies identify candidates for coaching. Download the executive summary of 2013 Healthcare Benchmarks: Health Coaching. 2013 Healthcare Benchmarks: Health Coaching is HIN's fourth annual collection of data points on health and wellness coaching. This resource presents actionable new data on overall health coaching activity, with the latest metrics on the prevalence of health coaching, program components, delivery methods, preferred behavior change models, coaching case loads, ROI, future programs and more. 2013 Healthcare Benchmarks: Health Coaching is available from the Healthcare Intelligence Network for $137 by visiting our Online Bookstore or by calling toll-free (888) 446-3530.